William Henry Jackson (generally known as 'Harry', a name we will use) was born in Beeston, Notts in 18962, the eldest of seven children of William Henry (b. 1873, Beeston) and Harriet (b. 1874, Hunslet, Leeds, née Chapman). William Henry senior worked as a cycle painter at the Humber works in Beeston, both before and after his marriage to Harriet in 1894. However, in about 1899 they moved, by now with a family of two, to live in Birkenhead in the Wirral area of Cheshire, across the Mersey from Liverpool. In 1901 they were living at 33 Woodville Road, Birkenhead, now with a family of three, with William Henry working as a bicycle enameled3. By 1911, the family, now including all seven of their children, was living at 529 Rodney Street, Birkenhead. William Henry was still painting cycles while Harry, now aged 15, was working in a shipyard as a boiler maker's assistant4. When war came in August 1914, many young men were quick to enlist, keen to play their part before it was all over - 'before Christmas' was the popular belief!. But the minimum age for service overseas was 19 although men could join for training earlier. Accordingly, it seems, Harry enlisted at Birkenhead with the Cheshire Regiment in April 1915, when he was still 18.5. After a short time at the Infantry Base Depot, Private Jackson was assigned to 1/4th Battalion, one of the regiment's Territorial Force battalions which had been formed immediately after the outbreak of war. After training. the battalion, as part of 159th Brigade of 53rd Division, left from Devonport for Alexandria. It was bound for Gallipoli to support the Dardenelles Campaign which had become a costly battle of attrition. The battalion landed at Suvla Bay on August 8 1915 without opposition. However in the somewhat disorganised and unsupported attacks that followed it met determined opposition and suffered huge casualties - 11 officers and 250 other ranks in the first two days alone. In the summer months, the heat, insects, shortage of drinking water and poor sanitation had had their inevitable effect but when winter closed in, with little or no progress in the fighting, the effects of the harsh weather - heavy rain followed by snow and low temperatures were even more devastating. Disease became widespread and, in December, the decision was made to evacuate the troops. It had been a disaster with huge casualties - including from disease and some freezing to death - but, after moving to Egypt, the battalion had a chance to recover and reorganise6. By the Spring of 1918, the situation on the Western Front was critical. A German offensive had depleted the British forces and reinforcements were difficult to find. 1/4th Battalion was one of several redeployed in an attempt to fill the gap and left from France at the end of May. On July 1st, the battalion joined 102nd Brigade, part of 34th Brigade at the front line. The first part of the month was taken up with training, familiarisation and moving into position. On the 22nd, it was at Oulchy le Chateau in the Aisne Department, north of Paris which was then under threat by enemy attacks. The battalion's orders were to attack on the 23rd in an action that was Harry's first and, as it turned out, his only experience of action on the Western Front. As the battalion approached its position, it came under heavy shelling and were exposed to very heavy machine-gun fire which continued relentlessly as they attacked. Eventually however, they were able to consolidate the line, alongside 1/7th Cheshire Regiment and French units. Casualties had been very heavy - the total of 4 officers and 276 other ranks included 86 wounded and 185 gassed7. Private Jackson was one of those wounded and he was evacuated to the 63rd Casualty Clearing Centre where, despite every effort, he died. Private Jackson was buried in Senlis French National Cemetery along with six others from his battalion and four others from 1/7th Battalion who had been injured or gassed in the attack. The cemetery is located on the outskirts of the small town of Senlis in the Department of the Oise, north of Paris. Senlis was entered and damaged by the Germans on the 2nd September 1914, and evacuated by them a week later. It was not involved in the fighting on the Aisne and the Marne in 1918; but during those operations it became a French Hospital centre. The British 63rd Casualty Clearing Station was at Senlis for twelve days in August 19188. Senlis French National Cemetery was begun in June 1918, and closed in December 1921. There are now over 100, 1914-18 war casualties commemorated in this cemetery9. 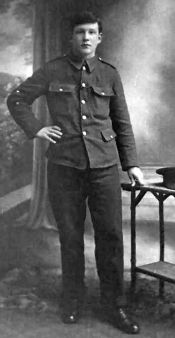 Private Jackson was posthumously awarded the British War Medal, the Victory Medal and the 1915 Star10. His financial effects of £21 13s, were paid to his mother, as his sole legatee, on 12 November 1918 and she also received his War Gratuity of £15 on 13 December 191911. Around this time, and certainly by 1921, the family had moved back to Beeston where they set up home at 11 Chestnut Avenue, part of a terrace of houses off of Hall Croft12 with William Henry becoming a house painter. Harriet died in February 1930, aged 55 and William Henry in February 1953, aged 79. Each of their five surviving children married and lived out their lives either in Beeston or the immediate area.13. 2His birth was registered in Basford Registration District (of which Beeston was part) in Q3/1896 (Ref 7b 211). An unverified source suggests that his birthdate was 12 June 1896. Harry's siblings were Doris (b. 1898), George (1900-1995), Eva (c1903-1912), Herbert (1906-2006), Olive (1908-1995) and Fred (1910-1982). 6This account of 1/4th Battalion Cheshire Regiment deployment at Suvla Bay is based on its War Diary and general accounts of the Dardenelles Campaign. 7This account of 1/4th Battalion Cheshire Regiment deployment in France is based on its War Diary. 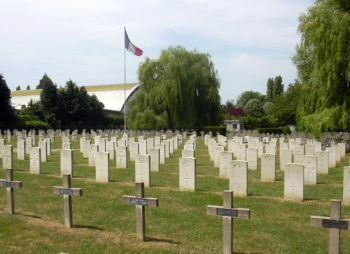 8There are contradictions between these dates (which are also stated in the historila record of 63 CCS) and the date of Private Jackson's death as, between June 18 and Augut 18 1918, the Station was recorded at Watten in Northern France, some 220km north of Senlis. Nevertheless, Private Jackson's death is recorded to have been at 63 CCS as part of his entry in the Army Register of Soldiers' Effects. 10Details from Harry's Medal Card and Medal Rolls - available on ancestry.com. 12William Henry and Harriet are listed at this Beeston address in the 1921 Electoral Roll.